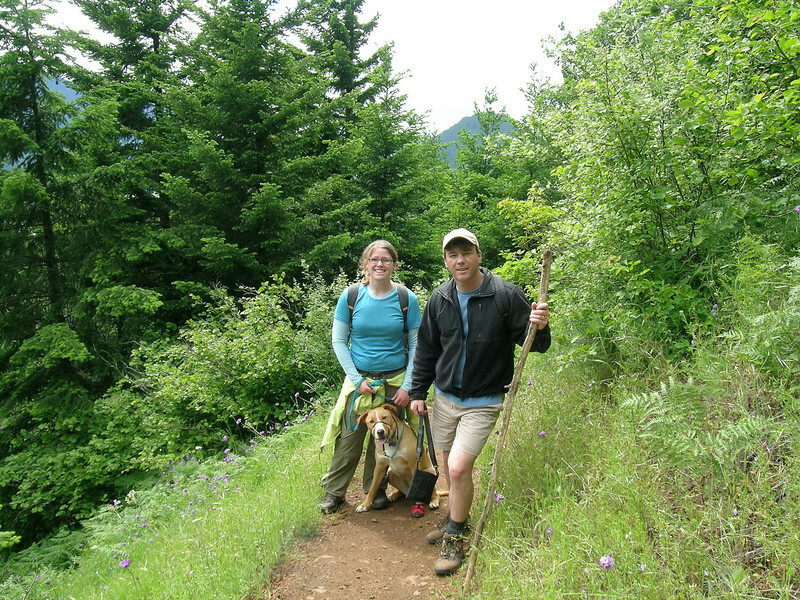 Christina (from WEST COAST MOUNTAIN group), Dave and I hiked Dog Mountain in the Columbia Gorge (WA side) Sat., June 7th. Dog Mtn is 7.4 miles r.t. with 2850 ft. of elevation gain. Christina brought her dog, Casey, the perfect hiking dog! It was overcast (no rain) which kept us nice and cool. Dave had to turn around after several miles due to his bad knee. As we came out of the trees, the wind picked up. The balsamroot were in bloom and we saw numerous wildflowers. This hike was a milestone for Christina and she did awesome!!! As we left the top and began our descent, light and fast moving clouds came up the mountain. The wind really picked up and it was quite breathtaking. Walking down the ridge was amazing! I had some pain in my left knee (previous injury) but made it down just fine. Great day!! !